Quilting was a passion of my mother’s. She had a huge stash of fabric, and loved laying out colors and patterns when she was designing a quilt. She always made sure that among all the beautiful fabrics and colors that there was at least one “ugly,” a fabric that she didn’t like. The “ugly” fabric helped to bring variety and texture to her quilts. 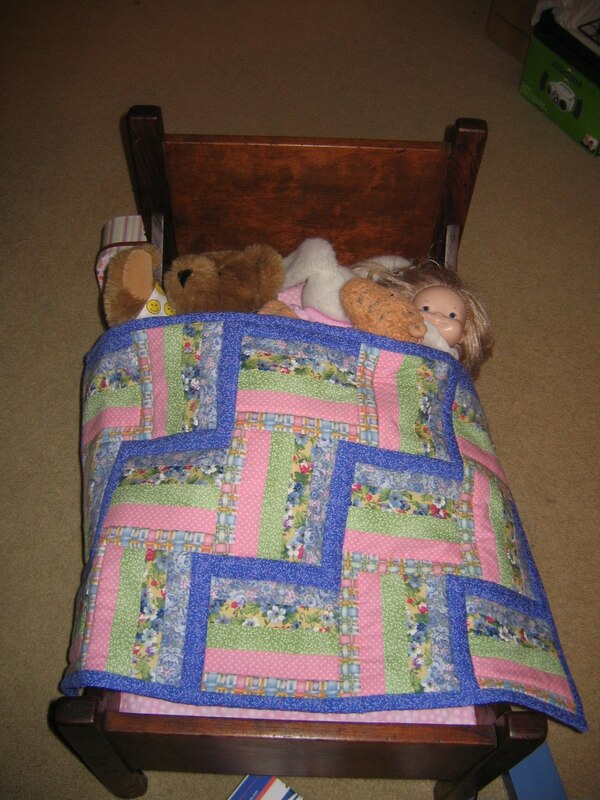 Lily’s doll bed and quilt — I can’t see an “ugly”, can you? Lily and Emmy each have a baby quilt that my mom made for them. The girls bring Grandma’s quilts everywhere when we travel. They snuggle with them in the car and on the floor at Grandpa’s house. Those quilts have been to Colorado, Pennsylvania and Canada. They are comforted so much by Grandma’s quilt; in part, I think, because those quilts are such a comfort to me as well. Piecing together those quilts was very time consuming. It required a lot of patience. Ironically, Mom did not have a lot of patience. She stuck with her quilts because she loved the end result. And then, she would dig out different patterns with different fabrics and start all over again. My little blog is kind of like a quilt. I love being able to change things around and put the pieces together in different ways. At Bloggy Boot Camp, I learned so much about design from the wonderful Renee. (The above header, not at all what I have in mind, is a temporary fix since my BlogHer ad was too low on my page.) I’m playing around with a new design for my blog. To help me with my design, I’ve started an Inspiration Board at Pinterest–a website Mom would have loved! Have you noticed one of the changes I’ve already made? I finally bit the bullet and bought my own domain! Eventually, I want to move Lemon Drop Pie to a new location. All of the changes I have in mind take a lot of patience–something which I have in short supply. Like mother, like daughter. Stick with me…and let’s see what happens! That's so funny about the ugly fabric. 🙂 Do you like Blog Her? I was invited by them, but ended up turning it down. I do like BlogHer. One of the great things is that they will put links to my posts in their ads every once in a while! It's great exposure. The little quilt is beautiful. I love changing things around on my blog. I was going to ask you what the ugly was in that quilt but clearly you don't see it either. Those quilts are treasures, for sure.So does this mean you'll eventually move to WordPress?